Across the country the outdoor fireplace has become the heart of a truly complete outdoor living theme. Quite often clients having a beautiful outdoor kitchen built are including the outdoor fireplace for relaxation and enjoying those cool evenings entertaining family and friends. This also considerably extends the time you can enjoy your backyard theme as the season gets colder. It’s the perfect finish to your backyard oasis. There are many different types of outdoor fireplaces; we recommend having a quality designed fireplace kit installed and choose from endless options for your exterior finish. You may choose from beautiful stacked stone or flat travertine stone with custom inlay work, polished brentwood stone to accent the raised hearth and mantel; there are too many options to list. You may also contract with your NOKFA design-builder to incorporate your fireplace into your screen enclosure room or simply have the fireplace installed on your new or existing open air patio. 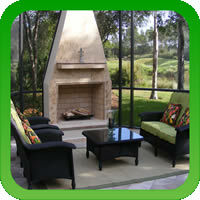 Your outdoor fireplace can typically be designed for standard wood burning or piped for gas logs. Your NOKFA professional can help you choose the design and look of your outdoor fireplace and install a quality product that you will enjoy for years to come. The heart of the outdoor fireplace begins with the fireplace kit (base unit) choosing a good quality kit with a proven track record of its dependability will determine if it will last a few years or for a lifetime. Two of the most popular brands of outdoor fireplaces are Firerock and Isokern. Both offer superior design, attention to detail and overall quality of performance and we are proud to endorse both of these quality products. If you have any questions please contact our customer service or your NOKFA professional.